As any golfer will tell you, golf is a seriously competitive game: you play not only against the opposition but yourself, your handicap, the course and the elements. No surprise then that when Carnoustie Golf Hotel was being planned, it set out to be better than anything else of its kind in the world. 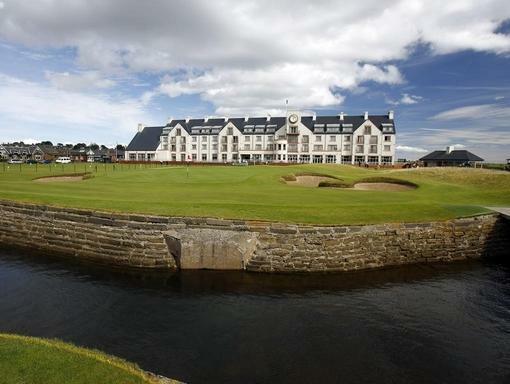 Certainly, Carnoustie's Championship Course (home of the 1999 and 2007 Open) is arguably the toughest in the land and the other two, The Burnside and The Budden Links, throw down their own particular gauntlets. Whichever one you are playing, remember to occasionally take your eye off the ball and drink in the amazing scenery. There’s a competitive edge to the Dalhousie Restaurant, too. Floor to ceiling panoramic windows look out over the first tee and the eighteenth green; the decor is luxurious with tables spaced well apart; and there’s no argument about the food. Premier local produce seafood and salmon, venison from the glens and Angus beef form the basis of Scottish cuisine at its best. There’s also a full bar menu available in Calder’s Bar for light meals alongside a good nip of whisky. Carnoustie's bedrooms are a triumph of colour, comfort and design. Many boast extraordinary views over the Championship Course, the sea and the village of Carnoustie. For further relaxation, there’s a swimming pool, gym, sauna, steam room, whirlpool and a host of spa treatments for further relaxation.